*astTECS PRI cards are high-performance, cost effective telephony cards available with carrier grade optional hardware echo cancellation. 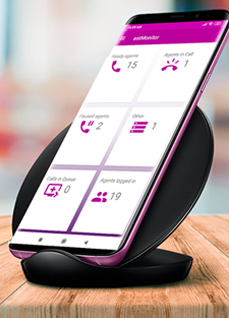 The card allows up to 96 (T1) or 120 (E1) channels and allows integration of legacy telephony systems with emerging Voice-over IP (VoIP) technologies. 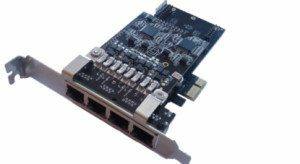 *astTECS E1/T1/J1 digital cards are designed to work with Open Source based VoIP platforms such as Asterisk® (e.g. PBX in a Flash®, FreePBX® Elastix®) & FreeSWITCH®. It supports industry standard telephony protocol families. Both line-side, trunk-side interfaces along with advanced call features are supported. The *astTECS Single Span E1/T/J1 cards allows up to 24 (T1) or 30 (E1) channels and allows integration of legacy telephony systems with emerging Voice-over IP (VoIP) technologies. The *astTECS Dual Span E1/T/J1 cards allows up to 48 (T1) or 60 (E1) channels and allows interconnection of legacy telephony systems with emerging Voice-over IP (VoIP) technologies. 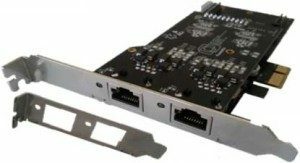 The *astTECS Quad Span E1/T/J1 PCIe cards provide the power to interconnect traditional telephony systems with emerging Voice-over IP (VoIP) technologies.